There are six bells high up in the tower at Stone, which sit in a wooden frame and is said to be medieval. The bells range in weight from 240kg, which equates to about 5cwt for the smallest, or treble bell, to 700kg, which is about 13cwt for the largest bell, or tenor bell. The oldest bell, the third, dates from 1450 and the youngest, the fourth, dates from 1795. There has been very little work done on the frame or bells, apart from general maintenance, since 1935 when the bells were restored in memory of Charles W. Player, a former captain of this tower and also a leading light within the Kent County Association of Change Ringers and also the Romney Marsh and District Guild. There are many towers within the local area with peal boards displaying his name. Four of the bells, the front four, sit on plain bearings and the back two have ball bearings, which would probably have been done in the 1935 restoration. Most bells today have ball bearings, which makes the bells run much easier and many a visiting ringer has difficulty with the bells on plain bearings. The anti-clockwise circle of the bells also catches a lot of visiting ringers out as most bells ring in a clockwise circle. At one time the bells were rung from the ground floor, as can be seen by the rope guides at the bottom of the tower. This must have been very hard work! It is much easier from the ringing chamber upstairs, but it is not known when the move to upstairs took place. 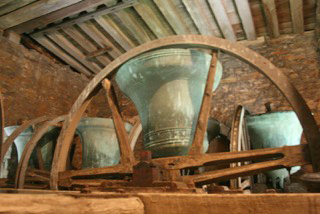 Today you would not be allowed to do a major restoration of the bells or fittings or even the frame as they are so old. Certainly the frame would have to remain intact and also the bells. All the bell hangers that have come and inspected the bells over the past years say the bells need retuning, but that would make them the same as other peals of six bells of about the same weight instead of remaining as an individual sound. The bells ring out regularly by a loyal local band for services, weddings, practices and some other important events. Bell ringing is an old English tradition and it is believed that there has been ringing at Stone for at least 400 years. It would be a shame to see this tradition come to an end at Stone, or any village or town that has churches with bells. Learners are always welcome. You don’t have to be big and strong to ring bells, or have a musical background. You do not have to be religious, all you need is a little co-ordination, so basically if you can ride a bicycle you can ring. It is very good exercise especially for the tummy muscles, arms and upper body. If, as at Stone, there are forty five stairs to get to the ringing chamber (some towers have many more) it is good for the legs. It keeps the brain active and also you make lots of friends from all walks of life from all over the country. So why not give it a try? Get in touch with your local ringing master to find out more. The best person to contact is Frank Wenham on 01233 758 362, who will be only too pleased to hear from you. 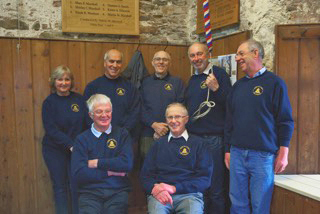 For more information about bell-ringing, see www.bellringing.org.